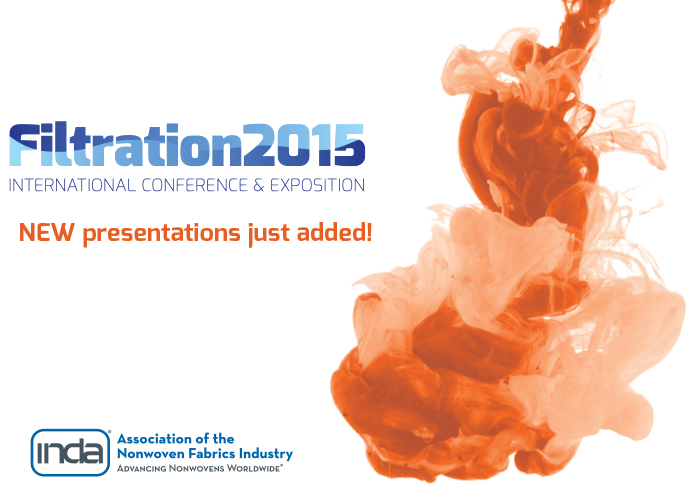 Cary, NC – Oct. 21, 2015 – With new presentations by filtration experts added to the Conference, over 135 exhibition displays, and strong advance registration, INDA is gearing up for its largest turnout ever at the Filtration 2015 International Conference & Exposition. More than 1,500 delegates and 140 exhibitors are expected to attend North America’s most prominent filtration event Nov. 17-19, at Chicago’s Navy Pier. At the Conference on Nov. 17, attendees will learn the latest in market trends and statistics, cutting-edge technologies, filtration solutions, and industrial air filtration. Speakers include leaders from Camfil Americas; DuPont Protection Technologies; GE Water and Process Technologies; Nederman LLC; Mann+Hummel Innenraumfilter GmbH & Co. KG; and W.L. Gore & Associates Inc., among others. Advance registrations and reservations for the Exhibition, which follows the Conference, Nov. 18-19, show the entire value chain from around the world will be represented in the Windy City. “The high-quality conference program, plus training, exhibitions, and opportunities to connect with suppliers and customers from around the world – all in one location – makes Filtration 2015 the industry’s most important global event,” said INDA President Dave Rousse. Armando Brunetti, Executive Vice President, Camfil Americas, will share his perspectives on customers’ needs based on the realities of the North American market and global business trends. High Flux Tyvek® for Filtration, presented by Hyun Lim, Ph.D., Technical Fellow, DuPont, Inc.
Filter Media & Filter Laboratory Tests As It Relates to Industrial Use, Matt Gessner, Application Engineer, W.L. Gore & Associates Inc.
For full program details and registration information, visit http://www.inda.org/events/filt15.